This course intends to offer participants in-depth theoretical and practical tools for communication and media production. The project concentrates on the diversity of means of the ‘reflexive’ tradition that works in the tension between realistic imitation and self-conscious artifice, i.e. between presentation and representation. With the course “Staging the Message. The Architecture of Communication” we will analyze, discuss, learn, test and develop – with the support of excellent scholars and practitioners from the field of the image, writing, editing, architecture and design (see description of the modules below) – how the form(at) of your dissertation/research – right from the start, and during the development of your research as a whole – can enable you to critically reflect and develop its content through the interplay between content and form; while the chosen and developed form also will enable you to broadcast, (edit, communicate and mediate) your ideas (content) to an audience within our information age at large. With its special emphasis on the interplay between content & form this course – overcoming the problem that dissertations almost never work as publication, we like to clarify that every relation needs a mediator; that this mediation comes with a form; an aesthetic discourse that by itself already empowers, limits and produces a specific kind of value system that (co)-produces, reworks and mediates the content. Form and content operate always interdependent of each other. Without mediation there can be no communication: Form is content, content is form, says Beckett, and only through a form(at) – and being aware of its consequences – you can start and are able to reflect, curate, edit, produce and direct information in communication to yourself, others and an audience. With Modernism architects started really to see how important the intimate relation between architecture and publication is. It is of no coincidence that Le Corbusier listed his profession as “homme de lettre”(man of letters) instead of having the name architect in his passport. Le Corbusier was meticulous how through page lay out, the form of type, the genre of writing, photographs, diagrams, sketch books, exhibitions and even promotional material, his ideas could be mediated[i], but also how these formats could help him to advance his ideas about architecture, urbanism and society in the new machine age. For contemporary architects, such as Rem Koolhaas, writing, making publications, editing journals and designing exhibitions has been inseparable from their practice too. Part of the work is to describe architecture’s evolving present, … to prepare ourselves to deal with issues, …to know what kind of architecture you want to do. “I try out different genres, different tones, clinical – Generic City, or hysterical – Junk Space.” says Rem Koolhaas. Through experimental forms of architecture communication (books, journals, genres, models, etc.) he discovers what the evolving present is about, and where moments of transformations can be enacted. 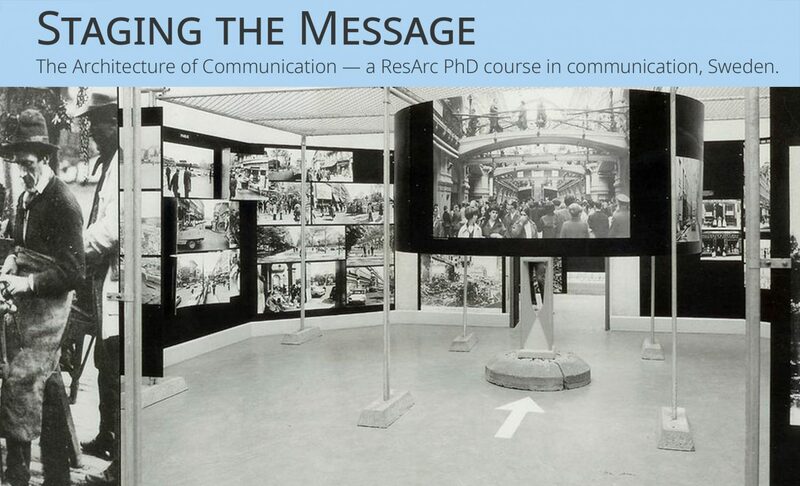 Another essential element of the communication course is how your mediated research can establish a pro-active relation with its audience in today’s society. In reaction to the virtual realism of the spectacle dominating mainstream media – which prevents a substantive use of word and image, this course deals with the textual, visual (photography, video, internet) and spatial practices that further more refined, complex and argumentative forms of communication and foreground the constructed nature of their messages in order to solicit the active interpretation of the viewer/reader. To paraphrase architect Stefano Boeri we are in need of interactive antennas that counter a geopolitics that destroys any chance of communicative action. It is for this reason that the course focuses on the practices of a narrative language use in text, image, spatial and electronic media with emphasis on the potentialities and richness of the ‘reflexive’ or ‘dialogic approach’. It tries to recuperate the specificity of its progressive and participatory practice – due to its role in the socio-cultural context producing meaning and symbolic values – by concentrating on the editing and making process. Which is to say that the course will introduce a way of directing that structures the collection of information and its editing in such a way that the staging, the ‘mise-en-page’ of the message gets the complementary sensitivity its content deserves. The course consists of three seminars (each three days long: Wednesday, Thursday and Friday) and takes place at the newly established Art-Campus and Architecture faculty in Umeå. The course is headed by Roemer van Toorn and developed in close collaboration with experts from the different fields of communication and media. Each seminar – module – will be devoted to one specific framework (see below) and will include introductionairy and specialized internal and public lectures besides working sessions where we discuss the readings, your blog, analysis of communication projects and discuss possible form(at)s of your research content. Before each seminar begins participants will be expected to upload blog posts to the communication course website. For each seminar a collection of readings, and possibly projects to analyze, will be made available to all participants on the website. Besides critical comparative analysis of projects, in the sphere of communication, critical readings provided and their interpretive blogs, we ask each participant to “form(at)” his/her own research according to the knowledge and experiences s/he gained through the seminar. Besides preparing work in advance for each seminar, work will be further developed, produced, discussed and reviewed in collaboration with the guest professors present. Active participation in the seminar is required, including the submission of 3 blogs on the website and reworking of own research (it can be an article, the draft dissertation, video, photography, or other media that are an essential part of the research) during the three modules. After, and during the last seminar we will also work on a final presentation format.